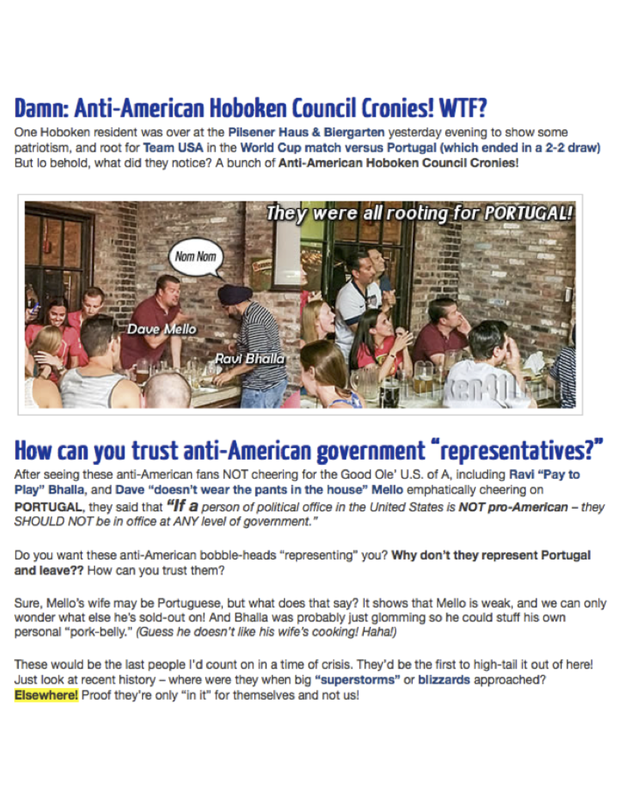 Hoboken411 raised its head out of the bunker Monday to launch a zany attack against two council members who were at a packed Pilsner Haus for the World Cup US - Portugal match Sunday. The only problem as has been the case with Hoboken411's local political "coverage" is it had no bearing on reality and the "evidence" actually proved opposite of the screed. The days of its notorious iron fisted censored attacks on Hoboken residents, city employees and officials combining lunatic fringe conspiracies, half-truths, distortions and elaborate smears blocking victims from responding has been largely relegated to the past along with his fellow Masonista minions. It came to an abrupt end late May 2011 when the FBI blew into town investigating the massive Data Theft Conspiracy putting the heat full square on the Old Guard and its soldiers who illicitly trafficked in confidential emails and data out of the mayor's office. Sensitive union negotiations with public safety were the backdrop during the year and half pillaging of electronic communications coming and going to the mayor's office. But here's some summer fun with fair critique of the lunacy published at what Councilwoman Beth Mason has called her favorite "news site." On Monday a reader emailed asking if MSV had seen the Hoboken411 "story" and said it was published with a video of Portugal's late goal. The video was promoted as evidence that Councilmen Ravi Bhalla and Dave Mello were rooting for Portugal. Hoboken411 suggested they should export themselves there. MSV video taken at the event proves it untrue. Ravi Bhalla went so bananas when the US scored his head almost hit the ceiling cheering with the Pilsner Haus crowd. David Mello was low key posting on his Facebook before the game he "wore red, white and blue (but there is a small green and yellow striping)" in his shorts to honor Portuguese heritage and he was fine with any eventuality. MSV was on site covering the event and saw it firsthand. The lunatic fringe low carb promoting website continued to go on lambasting the targets of his hatred saying they should go to Portugal among other zany things more welcome in Bellevue then Hoboken.